It takes more than hosen and a long gown to recreate the dress of a Venetian nobleman. Finishing the look requires the right accessories. I discuss body linen and shoes elsewhere in this site. This page focuses on the stole, hat, belt, and points. These accessories help create the distinctive Venetian male "look". 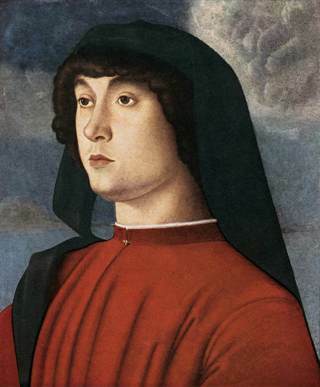 The item that strikes me as the most distinctive Venetian accessory for the patricians and citizens is the becho or bechetto, that long band of fabric usually worn over the left shoulder, and called elsewhere a stole or stola. Newton writes that it was usually about 25 centimeters wide, and even when worn with a gown of scarlatto or cremesino, it was usually black (see the toga page for images). According to Newton, the becho is a vestige "of a piece of extraordinary headwear – the rolled hood." This head covering, when it ceased to be worn as a hood that pulled over the head, evolved into a decorative hat, as worn by this young man (below left, red toga and green hood). 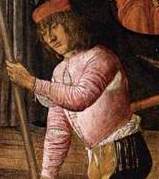 I find that, like many of the Venetians in the crowd scenes, my husband is likely to casually grasp the becho when standing still if his hands are otherwise unoccupied. This accessory is exceptionally easy to recreate, as it is just a long, narrow rectangle of hemmed black fabric. The neat little hat of the Venetian gentlemen, the bareta, at first appears quite simple. 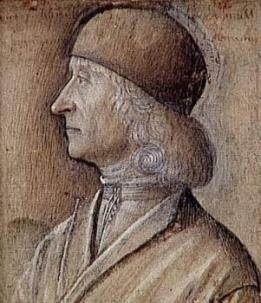 It is usually black; people in colored or interestingly shaped hats are usually young men or gondoliers. It appears to often be worn down over the forehead, but at other times it perches on top or even toward the back of the head. Sometimes it has fairly straight sides, sometimes it has sides that slant out toward the brim, and sometimes it swells out from the crown and then pulls back toward a snug brim, more like a modern beret. Sometimes it has a flat top and sometimes a rounded crown. Even in a single scene many hats shapes are visible together. I found two fairly simple ways of recreating the bareta, but I lack the skills at haberdashery to improve beyond my current attempts. The first two hats I made my husband were wool stitched over homemade buckram (burlap fabric stiffened with Elmer's glue - because those were the materials I had on hand). The top was a flat oval, and I stitched a 2.5 inch band straight down from the edge of the oval. It looked good enough for several years of wear, and yet, not right. One thing that bothered me about this hat was how clearly the stitching line between the top and the side stood out. Nowhere in the paintings or sketches did the hats show lines like that, although of course black is terribly hard to interpret in paintings, especially miniaturized reproductions of paintings. My second attempt was even simpler. I bought a simple black wool felt hat at a thrift store, cut off the flared brim and ugly fake flowers, soaked the hat with warm water, and then stretched it (on successive evenings) over assorted metal containers from my kitchen. When the hat threatened to pop off my improvised hat forms, I wrapped it in place with a towel. This result pleased me even more, as no stitching line was visible and the top of the crown curved slightly, more like the images I was trying to reproduce. By the images on the toga page I note the many representations of togati wearing belts, and the almost equal number of patricians which are clearly not wearing them. 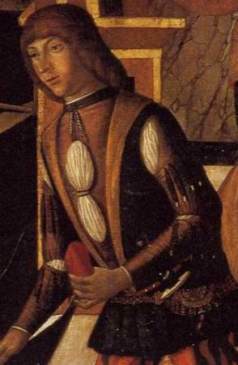 A belt (below) is actually one of the only extant garments I know of from late fifteenth-century Venice. This belt has been remounted on black velvet, has a pendant portion that hangs down below the silver-gilt buckle, and is decorated along its length with enameled sexfoils. Although this is quite likely a woman's belt, it appears that men wore belts with similar decoration along them. I see several black belts in this image that have dangling ends and silver decorations on them. 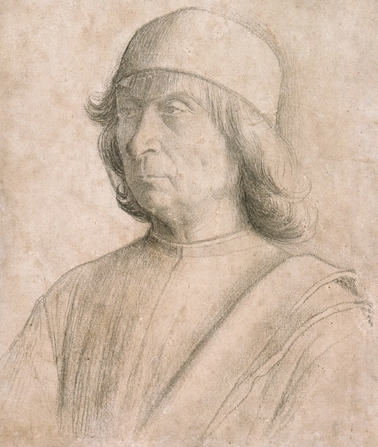 I have read no references to points in the books on the Italian Renaissance I have found, but references from contemporary English sources describe both silk points and leather ones being issued to the king's servants. The silk laces with gilt brass aglets pictured in The Tudor Tailor are from c. 1600-1603, yet look much like the fingerloop braids pattern, "a lace bene rounde of 8 bowes c. 1475." Archaeological evidence of English laces is detailed in Dress Accessories 1150-1450, with drawings of multiple extant copper-alloy chapes, some with traces of silk and leather inside them. Some of the laces in the paintings above appear thicker and more substantial than the result I achieve making fingerlooped braids with silk thread; perhaps these are woven tapes or ribbons. 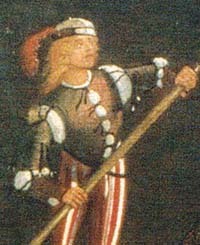 Contrasting colored braids appear appropriate for gondoliers and young men, but the togati tie their vesti closed with black or, if wearing a red gown, white. Although I know how to make fingerloop braids, having three children (one of which is only 13 months old) makes completing the projects next to impossible. I just haven't figured out how to set down a braid quickly and then pick it up again after the baby stops crying! I am also not particularly skilled in metalwork, and I have not yet found a sources for premade aglets small enough to pass through the eyelets I stitch, thus finishing the ends of my braids is a slow and clumsy process for me. I still have many, many more points to construct. The metal buckle and decorations on the black velvet belts are not items that I ever expect to learn how to fabricate myself, and I have not yet hunted down a place to purchase such accessories. Once I have the metal bits, sewing a narrow velvet belt should be easy. Although the hat my husband currently wears is fine, I look forward to learning more about constructing hats, so that I might try making him ones out of silk and velvet. 1. Stella Mary Newton, The Dress of the Venetians, 1495-1525 (Aldershot, England: Scolar Press, 1988), 12. 5. 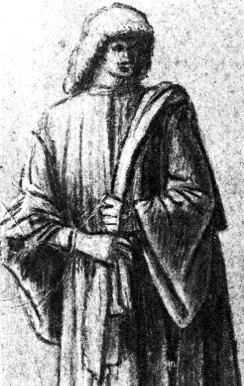 Jacqueline Herald, Renaissance Dress in Italy 1400-1500 (London: Bell & Hyman; Atlantic Highlands, N.J.: Humanities Press, 1981), 180. 6. Caroline Johnson, The King's Servants: Men's Dress at the Accession of Henry VIII (United Kingdom: Fat Goose Press Ltd, 2009), 17. 7. Ninya Mikhaila and Jane Malcolm-Davies, The Tudor Tailor: Reconstructing Sixteen-Century Dress (Singapore: B T Batsford, 2006), 16. 8. Lois Swales and Zoe Kuhn Williams, Fingerloop Braids, http://fingerloop.org/patterns.html#n08 (accessed March 18, 2011). 9. Geoff Egan and Frances Pritchard, Dress Accessories c.1150-c.1450 (London: Her Majesty's Stationary Office, 1991, 2002), 281-290.